New Delhi (PTI): The Supreme Court today refused to pass any interim order against the Centre’s notification making Aadhaar mandatory for availing benefits of various social welfare schemes. A vacation bench of Justices A M Khanwilkar and Navin Sinha said that no interim order can be passed at this stage on the “mere apprehension” of petitioners that government may deprive people from availing benefits of various social welfare schemes due to lack of Aadhaar. 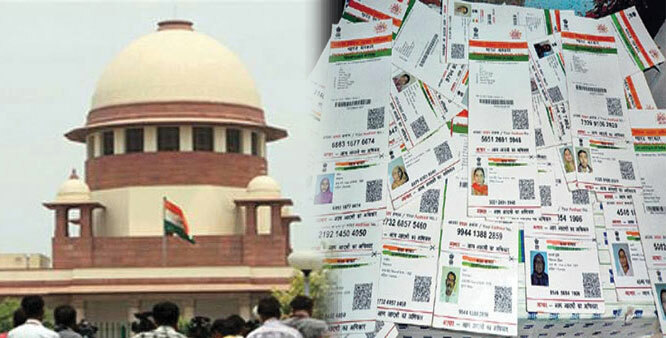 During the hearing, Additional Solicitor General Tushar Mehta told the bench that the Centre has extended the June 30 deadline to September 30 for those who do not have Aadhaar and are availing the benefits of various social welfare schemes. Senior advocate Shyam Divan, appearing for petitioners, told the court that the Centre should be directed not to deprive any person of the benefits of social welfare schemes which he/she is enjoying now due to lack of Aadhaar. “No interim order can be passed in mandamus on mere apprehensions. You have to wait for one week. If somebody is deprived (of the benefits) you can point out the same to this court,” the bench told Divan and posted the matter for further hearing on July 7. The apex court was hearing three separate petitions challenging government’s notification making Aadhaar mandatory for availing benefits of various social welfare schemes.